This work resonates color beauty with those wonderful complimentary colors and sense of vast space Nancy. F/L. Lovely poster tribute, Nancy! like/fav! I often think of how beautiful this country was before the Europeans came. It's so sad and painful that we continue to oppress the Native Americans and trample their rights . . . 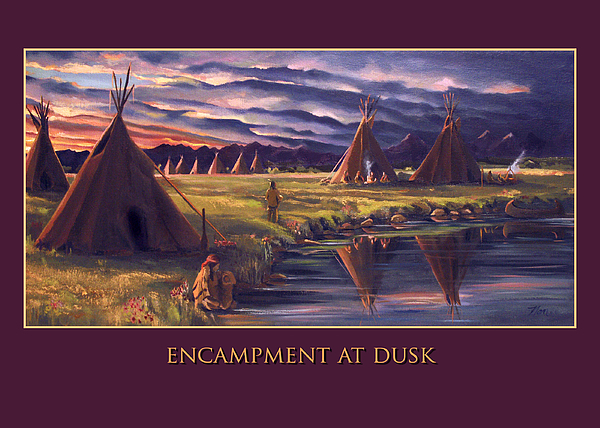 This art was created using research of the plains Indians during the early 1900's with a special emphasis in light and color during dusk. The image for prints can also be found in the Native American Gallery on this site of Nancy Griswold. This design is for Greeting Cards. There is more information with the print image.